Edit: Race Course Road has been renamed as Lok Kalyan Marg by local authorities and hence the address of Prime Ministers Residence is now 7 LKM or 7 Lok Kalyan Marg. Kindly read accordingly. After satiating curiosity around other aspects of Prime Minister’s perks, I was drawn towards one of the key aspect I was missing – Where does Indian PM live? Do we have a special residence for the head of our Indian state? What are the provisions around providing an abode to the PM? Here I am answering those questions after providing articles on other power perks of the posts including Air India One – Prime Ministerial Plane, Special Protection Group – Prime Ministerial Security and State Cars – Prime Ministers Road Travel. 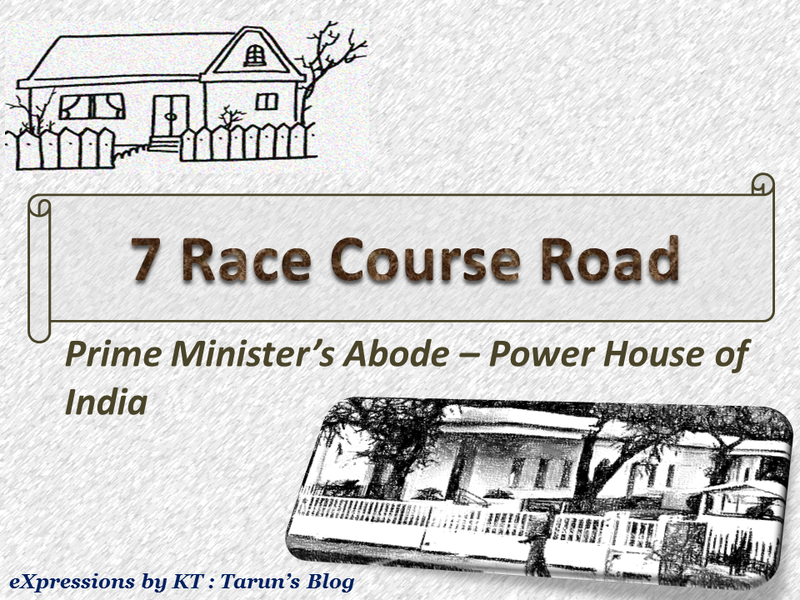 India has a special residential complex earmarked for the use of its Prime Minister and is known as 7RCR, shortened version of address of the complex 7, Race Course Road. This dedicated housing for the PM is synonymous with might, elitism and repute and is most powerful address of the country. This residence is not merely a structure of bricks but a living story of what happens at the help of power in India. 7RCR today stands as a grand book with each page signifying a significant memory from the history of independent India. Highs and Lows is another name of this which has been a witness to all the turns of Indian politics. It is this location which has been behind the fortune –good or bad - of India today and has been behind most decisions which have shaped this country. 7RCR did not enjoy the status of PM house since the advent of Indian independence but was given this status later as the need arose. Jawahar Lal Nehru used 3 Murti Bhawan as his residence which after his death was transformed into a memorial and library while Lal Bahadur Shastri resided at his house at 10 Janpath. After his death, part of this was converted into a memorial while rest of it was given to the Congress Party which now has its headquarters at the same address. Even Indira Gandhi stayed at 1 Safdarjung Road, which now is a museum, but was murdered in her own house and it was then that security of Prime Minister came to forefront of discussions. It was during this time that Rajiv Gandhi rose to power and was looking for a new address as he wanted to move out of the Safdarjung bungalow to leave behind bad memories. Thus in 1984 Rajiv Gandhi became the first occupant of 7RCR as a Prime Minister but it was still not an official residence of the PM. He lived in one bungalow at 7, RCR and it was only his successor V P Singh which gave this address its present status as earmarked residence for the Prime Minister of India. It was then that it was realized that security considerations could not be made using just a single bungalow and it required a much elaborate arrangements and more structures were brought together to constitute the PM House. These were originally designed by Robert Tor Russel who was part of the famed Luteyn – they person who is behind names of most powerful housing zone in Delhi. Once chosen to be a PM House, 7RCR was remodeled by Sunita Kohli who is an eminent expert in rejuvenating old properties. Though the name suggests that it is a single bungalow with the address as a name but in reality 7RCR today is a combination of five bungalows with the entire complex occupying an area of about 12 acres. The real estate covered by this housing complex could actually accommodate over 10 football grounds but then we would not expect anything less for the head of our country. The complex combines 1, 3, 5, 7 and 9 numbered bungalows on the Race Course Road in heart of Delhi. The story of this house started with a single bungalow with more added gradually to accommodate various concerns and need of time. Latest addition of these was the 1, RCR which was taken over by SPG once its incumbent was request by the government to release the house for its inclusion to the estate. This is now occupied by the Special Protection Group (SPG) and is kept ready for emergency situations. Bungalow number 9 is also occupied by the SPG and is reserved for them to manage logistics and other requirements of the force. Unlike many countries, the head of state in India does not have a combined office and residence. Indian PM has an office at the south block of the secretarial which is commonly known as the PMO or Prime Minister’s Office. The residence receives its name from the 7th numbered bungalow which ironically houses the residential office of the Prime Minister and is in itself a mini PMO. This bungalow has a new addition in form of a large hall called Panchvati which was constructed at the time of Atal Bihari Vajpayee. This hall can be modelled into 2-3 conference rooms and can also act as a banquet for a gather of 200-300 people. This can be used as a cabinet meeting room and can also be arranged to form a theatre. The bungalow also has another living room which can accommodate 30-35 people. So primarily, the bungalows left for use of the PM are the ones numbered 3 and 5. The incumbent can choose to live in one of these two and can use the other as a guest house. While Atal (and now Modi) used the later one as his residence, Manmohan used the former. House number 3 has a lush green spread-out lawn along with other gardening delights. The one chosen as the guest house has 2 rooms reserved as a hospital with staffed with doctors and nurses from AIIMS which is the best medical facility of city in many ways. The medical unit is almost a mini ICU on campus and is supplemented by a super specialty ambulance as stand by round the clock. There is an in-house helipad built in grounds of bungalow number 1 for emergency operations. The complex also has its own power sub-house to ensure uninterrupted electric supply. The estate also boasts of a 1.5 kilometer underground tunnel from the complex to Safdarjung Airport to relieve traffic restrictions during PM’s move and also for emergency evacuations in case 7RCR is under attack. Though each of the bungalows in the complex is modest by most standards with 5 rooms but together they bring the most of the elite residences to shame. Size may not be its most proud attribute but the residence of PM lacks nothing in terms of equipment. Anything one can think of on earth is available here. Just equipment and size cannot be the key aspect of the complex that houses the most secured person of the country. Security features are of most prominent concern while setting up such a residence. In true terms this complex is definitely the most secured residence of the country and no feather has been left unturned to provide an unbreakable security cover to the PM at his/her residence. While SPG is primary agency in-charge of the security, but it is aided by CRPF and Delhi Police to provide a three-rung security to the estate. The entire stretch of the Race Course Road where these five bungalows are located is permanent closed for normal traffic. The complex is bounded by high concrete walls to prevent any direct intrusion. The entire zone is a no-fly zone and airspace usage around the area is highly restricted and monitored. Samrat Hotel, which is the only tall structure around the complex, witnesses high level of security intervention by SPG. All rooms on top 4 floors are permanently occupied/ booked by SPG to prevent misuse of these which provide direct view to the complex. Adjoining complex, Delhi Gymkhana club nearby has numerous watch towers to keep a lookout on dangers to PM house. When entering the 7RCR complex, first bungalow to cross is the 9 number bungalow which acts as SPG checkpoint. Every visitor is thoroughly vetted at this checkpoint and only those who figure on the guest list are allowed in. This list is handed in-person by PM’s private secretary to SPG agent in-charge. In normal case a mobile phone is not allowed inside. No outside vehicle is allowed to go beyond this checkpoint and even high profile visitors including cabinet ministers have to park their official vehicles by the checkpoint. Special SPG vehicles are used to carry the guests from the checkpoint to the residential office of the PM. The only exception to this rule allowed by SPG is for the SPG protectees themselves which are allowed to take the vehicle carrying them into the complex. So this is a brief story of the most elite and power-packed residence of India which houses none other than the executive head of the country. As we already know from articles, we leave nothing to chance when we arrange for comfort, luxury and security of our Prime Minister and hence 7RCR is simply a testimony of that fact. I hope the authorities maintain those standards to ensure that the PM can continue to function without a threat looking over his/her shoulder. The only concern I read recently is that even these most secure houses are not earthquake resistant. In case, that is true, I sincerely wish the responsible officials take note of that and make relevant provisions to make it secure even from common natural threats. So what are your views about the article? Do you agree that PM needs such vast arrangements for housing and security? Express all your views in the comments and do subscribe to the email feed to keep receiving alerts on new posts with awesome gyan, bakar and expereiences.